See scan – very good condition. This is an extremely rare and scarce 1728 earliest Imperial Russia type of award and decoration presented for merit and high achievements – an Emperor Peter 2 award silver medal-rouble with special suspension and encrusted with a red stone at center of suspension. Back during those years when official medals were still not a popular award, many Russians received a distinction of their merit in the form of a silver rouble with attached special suspension. The medal rouble had been normally awarded to Army and military officers and other personnel as well as to others. The present piece is such a decoration. Front of the piece has been gold plated and original gold wash residue is clearly observed. All of the back is normal silver color and obviously worn by receiver. The suspension has some sun ray like engravings and at its center is a red ruby or other stone. Similar pieces had been described in couple of catalogues and we give a LIFETIME GUARANTEE of the authenticity of the present offered item. 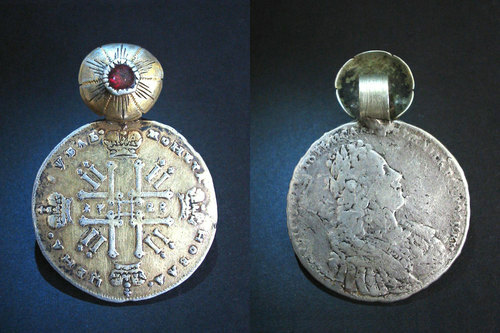 Absolutely scarce and impossible to find militaria, military collector piece and one of the rare Imperial Russian medals, coins and decorations in general.